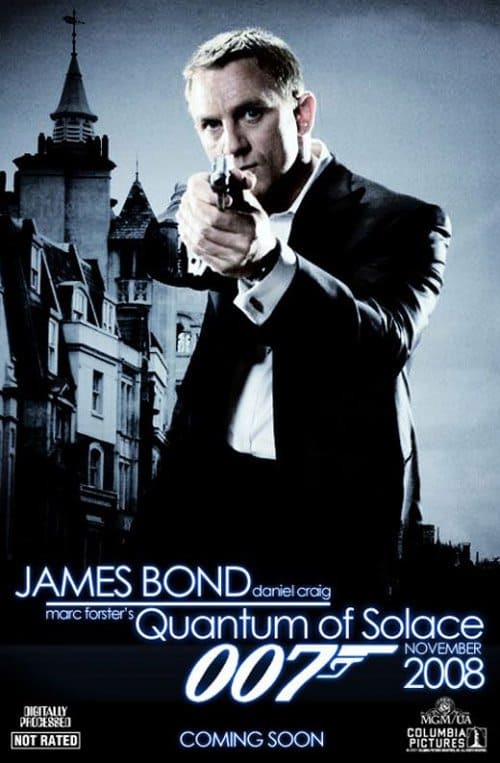 Quantum of Solace Daniel Craig returns in his second appearance, portraying James Bond. In this episode, the mission lines 007 up against Mathieu Amalric as a diabolical villain whose goal is to control one of the world’s most critical natural resources. The big-name supporting cast includes Dame Judi Dench, Jesper Christensen, Jeffrey Wright, Olga Kurylenko and Gemma Arterton. Quantum of Solace is rated PG-13 for sexuality, violence, and intense action sequences. Slumdog Millionaire is a romantic comedy, set in Mumbai, India. Dev Patel plays an 18 year-old street kid who becomes a TV contestant on India’s version of Who Wants to Be a Millionaire. His goal was not to earn the money but to win back the heart of Freida Pinto, the girl of his dreams. Slumdog Millionaire In English and Hindi with subtitles, is rated R for violence, profanity and disturbing images. The Alphabet Killer (Unrated) Crime thriller, based on a real-life case from the Eighties, revolving around a female police officer (Eliza Dushku) whose obsession with tracking down the serial child killer terrorizing Rochester, New York ended up costing her not only her fiance and job but her sanity, too. Cast includes Timothy Hutton, Cary Elwes and Bill Moseley. The Beautiful Truth (Unrated) Medical documentary by Garrett Kroschel suggesting that a cure for cancer might have been discovered in the 1920s by Dr. Max Gerson, an iconoclastic physician who came up with an unorthodox approach to treating the disease. The Dukes (PG-13 for sexuality and drug use) Crime comedy about two down on their luck members (Chazz Palminteri and Robert Davi) of a once-famous doo-wop group whose desperate financial straits leads them to try to pull an ill-advised heist of a dentist’s safe rumored to be filled with gold. With Peter Bogdanovich, Bruce Weitz and Elya Baskin. How about You? (Unrated) Christmas comedy, set in Ireland, about a young woman (Hayley Atwell) who has her hands full trying to fill-in for her widowed sister (Orla Brady) as the caretaker of the four residents of an old folks’ home over the holidays. Cast includes Vanessa Redgrave, Imelda Staunton, Brenda Fricker and Joan O’Hara. Lake City (R for profanity and violence) Sissy Spacek and Troy Garity co-star in this Southern drama about the return home under trying circumstances of a Prodigal Son to the family farm where he confronts his estranged mother about a deep family secret. Ensemble includes Rebecca Romijn, Dave Matthews, Drea de Matteo and Keith Carradine.